There is yet another new book out about the Long Range Desert Group. This one deals with the story about the Rhodesian who served with the LRDG. The only thing that I can say about this new book is that they are getting BETTER & BETTER. This one has been written by Jonathan Pittaway and Craig Fourie, and published in Durban, South Africa. 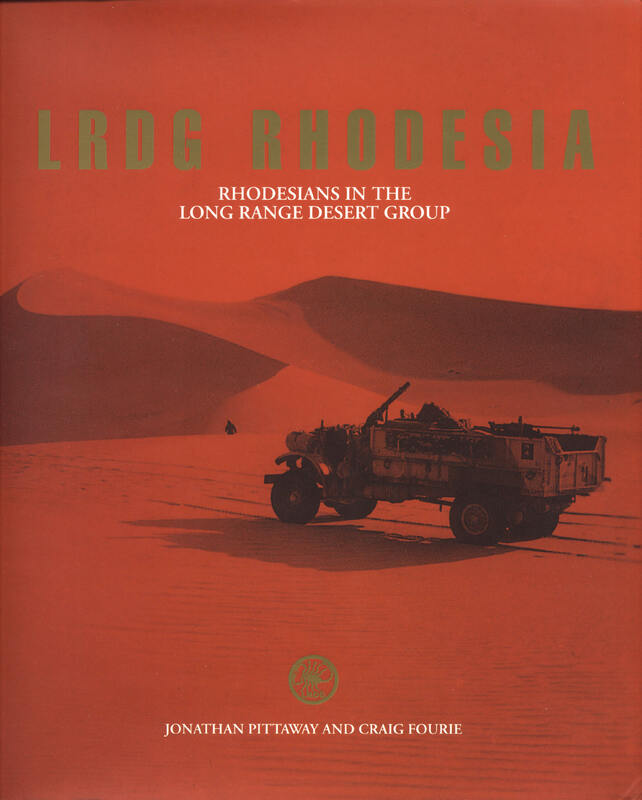 The title is “LRDG Rhodesia”, it comprises a total of 268 pages on a heavy stock paper, and is about the same size as the “The Kiwi Scorpions” book. Only a thousand copies have been produced and that is only 400 more than the 600 photos that the authors have managed to cram into this wonderful book. When I first saw Brendan O’Carroll’s book “The Kiwi Scorpions“ I spent the one whole day looking at the many previously unpublished photos and reading the captions. I mentioned in his “book review” that it was like looking at someone’s photo album. Well I can truly say that the South African boys have put together another LRDG photo album. There are many pages that have nothing else but photos (and captions) on them. And although I haven’t compared them with some of my many other references I don’t think there are more than a dozen or two that have been published before. The authors have divided the book up into seven sections. The Introduction has the usual Forward and Authors’ Preface. They then go into a history of the prewar exploration of the desert and a brief history of the LRDG. The next section deals with “The Desert” and in this section there are several short stories written buy LRDG troopers. The next three sections deal with areas of the war that previously, not much information was known. The Aegean, which was the battle of the Dodecanese Islands, the Middle East, where the unit was retrained and the Adriatic, where they spent time behind the lines in Albania, Greece and Yugoslavia. The authors go into great detail on the battles and additional training that the unit when through during this time. The next section deals with the LRDG Association and their activities and several Obituaries of their members. The last and final section or Epilogue has the units Honor Roll, Awards, Wounded, POW’s and the Nominal Roll etc. All in all this will make a fine addition to your collection of reference works of the LRDG. I know that I will be going through my copy many times in the succeeding months. I hope to receive a number of copies from South Africa and make them available in the U.S. As soon as they arrive I will post it on the web page. Book Review - "Bearded Brigands"
When I started the LRDG Preservation Society, I never realized that it would have so much worldwide interest. There were a few locals (with in the state of California) that had expressed an interest. But once we had the truck and began taking it to shows in California, Nevada, Oregon and Washington there was many more that shared their admiration of the LRDG and what we were trying to do, which was to promote knowledge of the group and the important part that they played in World War II. I must admit that it has been an interesting and exciting ten-year learning process. What has also been an extremely important part of the Society is our web page, which without the able development and constant updates by Scott (the web master) it would still be stuck in the sand. The web page is a continuing source of contacts throughout the world. And has been our primary media for spreading the word about the LRDG. Another useful media has been the new books and articles that continue to appear in print. This brings me to the start of another book review. The first one that I ever did for the web page was Brendan O’Carroll’s, “The Kiwi Scorpion’s. Prior to that I think the last one that I did was in high school and that was along time ago. The latest book out about the LRDG is titled “Bearded Brigands”. It is based on the diaries of Frank Jopling and was organized and edited by Brendan O’Carroll. In the beginning the Long Range Patrol (as the LRDG was originally know) was a secret unit and the members were not to take photos or keep diaries. Fortunately for all of us they all didn’t follow the rules. And Trooper Jopling was one of the biggest rule breakers, as he did both take pictures and kept a very detailed diary. In this book Brendan starts with a short history of the LRDG, for the first time reader who might not have the reference that you and I might have. Then there are a few pages about Frank Joplin. Then Frank’s diary starts with a Sept. 5th 1940 entry. I am not quite sure what I expected but what ever it was, I sure underestimated the contents of this book. Frank must have been writing whenever he wasn’t doing his military duties and then some. He goes into details as to what they had for breakfast, lunch and dinner. He gives distances traveled and goes into a lot of detail that I would never have expected in a diary. He did such a fine job that he was made the official historian for the unit. His work continued until his capture after the Barce Raid (Sept. 25th). Unfortunately the journal that he kept after his capture was lost. But you will have to read the book to find out how. Now if you take a peek at my list of books on the “Reference page”, you can see that I have read a large number of books that dealt directly with the LRDG and some that just had some reference to the LRDG. But this is one of the best for details of everyday LRDG life. Did I say there is 129 photos, some of which I had never seen before. I have been asked by the Publisher, Token Publishing Ltd. and the Author, of "The Kiwi Scorpions", Brendan O'Carroll to review his book for the web page, since many LRDG enthusiasts visit us. Now I have never claimed to be a writer nor a book critic but I will do my best. I received a review copy from the publisher on Dec 8th. I was initially surprised at the physical size of the book, which is whopping 12 inches by 8 inches. Most of my other LRDG reference books are about half that size. The number of pages (228) is about average for this type of book. Another surprise is the quality of the paper stock, with so many books coming out in paperback; it is pleasant to find that they used a heavy quality paper. When turning the pages one gets the feeling that you have two pages instead of one. The book is hardbound with a rich black leather type finish and the LRDG cap badge in gold is embossed on the front, with the title in gold on the spine. The first thing I did was to go through the book an examine its 256 photo's and captions, that's right 256. With so many I thought that I was going through someone's photo album, some pages only have photos and captions. Now I generally do not markup any of my books, but incase you are not as picky as I there is plenty of border room to make your own notes. Next I started reading, which took more days than I intended because the holiday seem to get in the way. The time in history covered is July 1940 until Dec. 1943, which is the specific time period the New Zealand troops were involved with the LRDG. Brendan has the usual Introductions, Acknowledgments, Map of North Africa, and something that I had not seen before, "The LRP Lament" and a poem "A Dedication to Brave Men". The rest of the book is divided into chapters in a manner similar to the Osprey Vanguard book, i.e. Formation, Early Offensive Operations, Navigation, Transport, and Weapons etc. That may sound a little confusing but trust me Brendan has done an excellent job. He had the opportunity to interview a number of surviving LRDG members that live in New Zealand and had access to the diaries of many more. Now as I was going through each chapter I kept coming across information that I did not know or answer to questions that I had been looking for. So for you other LRDG enthusiasts this book is a must to be added to your collection. Checkout this excerpt from "The Kiwi Scorpions" cover page! 21. Crichton-Stuart, Michael - G Patrol: the Story of the Guards Patrol of the L.R.D.G. 43. Jablonski, David - The Desert Warriors: The Battle for North Africa 1940-43 (1972). 104. Syrett, David. - Long Range Desert Group Operations in North Africa. City University of New York, Unpublished, n.d.